Standard and Poor released the latest S&P/Case-Shiller Home Price Index (henceforth, CSI) today. It shows that homes prices continue to decline in the DC metro area, down 0.9% July-to August, down 7.2% in one year. "At both the national and metro area levels, the fall in home prices is showing no real signs of a slowdown or turnaround [my emphasis]," says Robert J. Shiller, Chief Economist at MacroMarkets LLC. "Year-over-year and monthly price returns are continuing to either move deeper into negative territory or are experiencing persistent diminishing returns. There is really no positive news in today's report, as most of the metro areas are showing declining or vanishing returns on both an annual and monthly basis. Only two metro areas – Denver and Detroit – showed improvement in their annual returns and even those were reports of slightly less negative numbers." 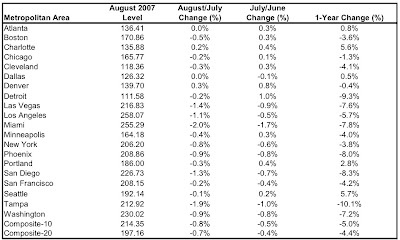 The CSI states that DC's August result is its lowest recorded annual return.